Oatmeal tastes extra delicious this time of year. Maybe it’s because breakfast now is enjoyed after running in 20 degree temperatures, not counting the wind chill. It is COLD up here, but at least we’ve been spared from the snow. I’ve been braving wind chills in the single digits to enjoy some miles because everything is covered in a thin layer of ice and 30 inches of snow. Afterwards, when my legs are tingling and my face is red from the wind, nothing tastes as good as a warm bowl of oats and steaming hot cup of coffee. With the exception of eggs and bacon after a hard, long run, I usually crave sweet over savory at breakfast. The thought of vegetables before lunch has always mildly disgusted me and I can really only tolerate breakfast veggies when it’s squash pureed and added to pancakes. 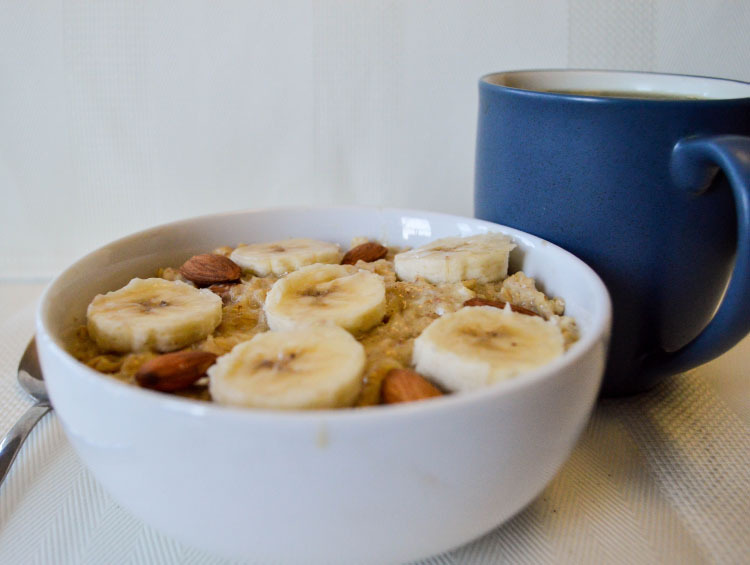 I’m much more of a fruit and grain person at breakfast: whole grain cereal with milk and berries, whole wheat pancakes with cinnamon apples, or this banana nut oatmeal. Clearly, I could never go Paleo/sugar-free/no-grains/name-your-trendy-diet-here. Still, I’ve been (unsuccessfully) trying to rein in my sweet tooth after finishing the Valpo Half Marathon about a week and a half ago. I say unsuccessfully because of the leftover bag of Halloween candy that I’ve been steadily devouring. Okay, and there were those brownies last week. Still, less training miles means less shoving carbs and sugar in my face. I didn’t say no sugar…just not as much as when I was testing cupcakes for the wedding, greedily enjoying leftover wedding cake, and eating my body weight in muffins and more muffins. Less training miles don’t change my basic desire for something sweet. I’ve started dreaming up what pies to make for Thanksgiving, and I’m trying to refrain from desserts until then because I know that I always go back for a second slice late at night on Thanksgiving. Thank goodness for fruit and it’s natural sweetness. Pears, bananas, and apples have been taming my sweet tooth lately (once I tell myself to stop giving into that bag of Halloween candy). 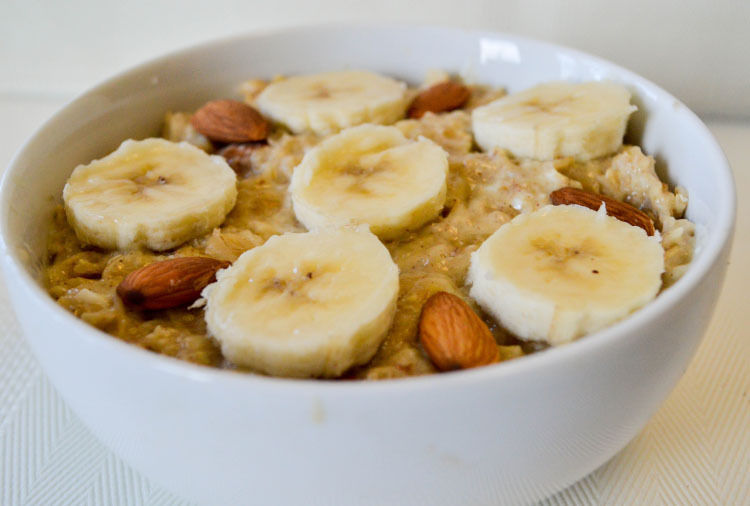 This banana nut oatmeal has the perfect touch of sweetness from, well, banana. You could add maple syrup or brown sugar, but honestly I thought it was deliciously sweet with just the banana, vanilla extract, and cinnamon. 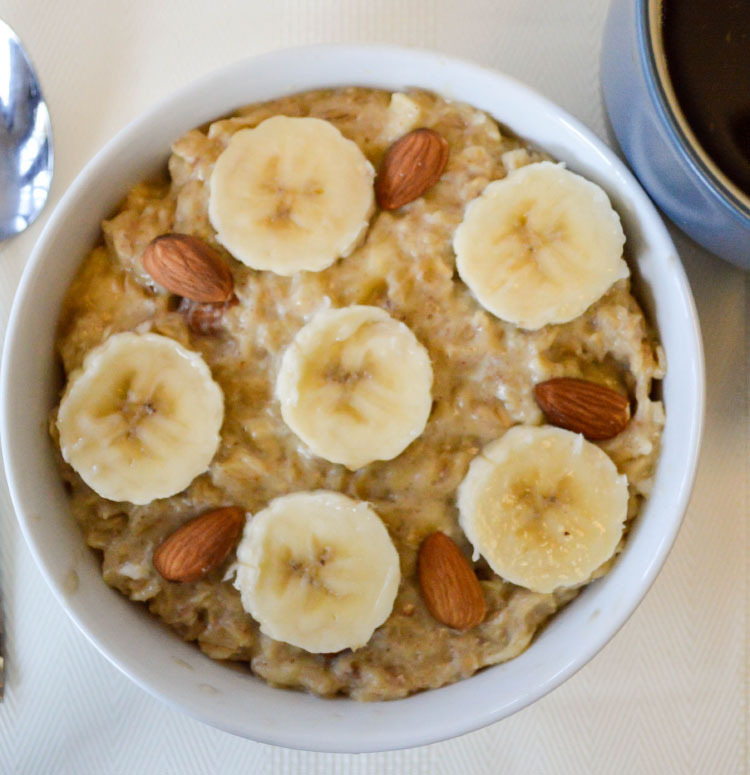 The almonds are what elevates this oatmeal dish beyond your everyday oatmeal. 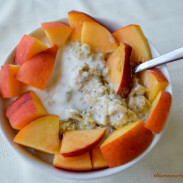 The nuts add a wonderful crunch that contrasts the creaminess of the oats. Plus, almonds are super healthy for you with monounsaturated fats, fiber, and protein! I’m already excited for my next chilly run if it means a bowl of banana nut oatmeal afterwards. Don’t forget the coffee. Bring the milk to a boil in a saucepan on the stovetop. Once the milk is boiling, add the oats and reduce to a simmer. Add the vanilla, spices, and salt to the oats. Cook the oats for five minutes, stirring occasionally. Add the egg to the oatmeal and quickly whisk it into the oats until cooked. You want a creamy texture, not scrambled bits of egg in your oats. Mash half of the banana and stir the banana into the oats. Remove the oats from heat and add the almonds. Slice the rest of the banana on top. 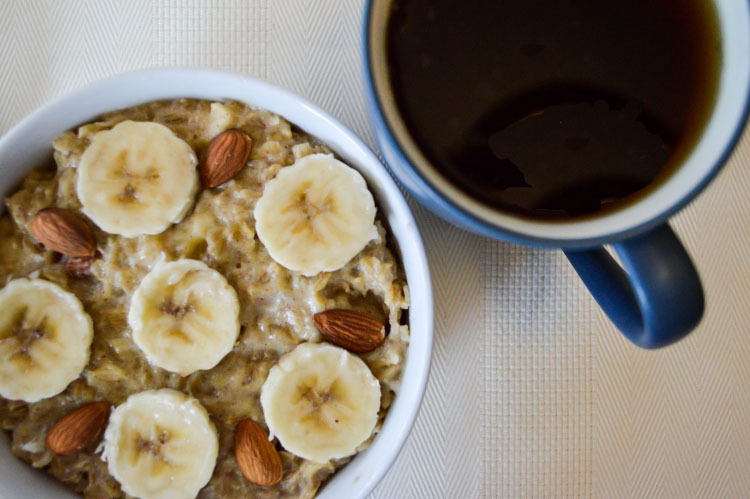 I love bananas and oatmeal! 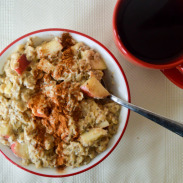 Oatmeal is my go-to winter breakfast. It’s filling, delicious, and portable (I often prepare a container the night before, to bring into work to heat in the microwave). I usually chop the nuts to put in with the oatmeal while it cooks, and substitute steel cut Irish oats for 1/2 or 1/3 of the regular oats in whatever portion I’m making. 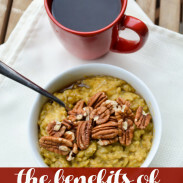 I don’t eat all Irish oats because they are more expensive than old fashioned rolled oats, but the little bit I do put in adds a bit of texture and extra fiber.